Special offer! Book by 31 May 2019 and receive a FREE flight and land package valued at $2000. Call us for details. Like so many of the islands in the Galapagos, San Cristobal is formed by dormant volcanoes. It lies to the east of the archipelago and is one of the oldest islands in the group. Approximately 6,000 people live on the island, making their living from tourism, fishing, in government offices, or off the rich volcanic soils with some limited farming existing in the highlands. 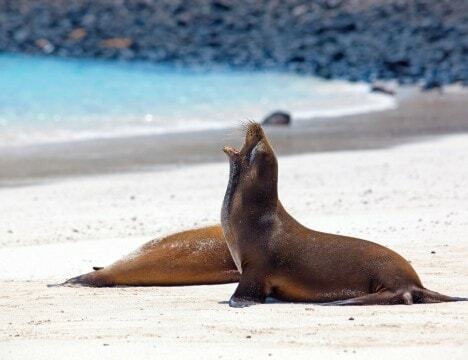 Puerto Baquerizo Moreno on the southwestern tip of the island is the capital city of the Galapagos Islands. A statue of Charles Darwin graces the harbor, marking one of the first places he likely stepped ashore in the 1830s. . The Silver Galapagos will circumnavigate Kicker Rock, one of the most iconic features of the Galapagos Islands. The small landform is formed by two tall towers of lava rock and when viewed from the south, resembles a sleeping lion. This phenomenon is reflected in the Spanish name “Leon Dormido” or literally, Sleeping Lion. As the ship steers around the islands, your Expedition Team will point out seabirds, such as Swallow-tailed Gulls, Nazca Boobies and frigatebirds. The islands’ geological formation and impressive height can best be seen from the ship, and conditions permitting, we will be able to watch the sun go down in one of the most beautiful settings of the Galapagos Islands. Our ship anchors in sight of the volcanic moonscape of Isla Bartolomé, at Sullivan Bay. Zodiacs bring guests ashore to ascend a boardwalk of 388 steps. Passing through the arid volcanic landscape provides a chance to watch for lava lizards, Galapagos Hawks, and Blue-footed Boobies. 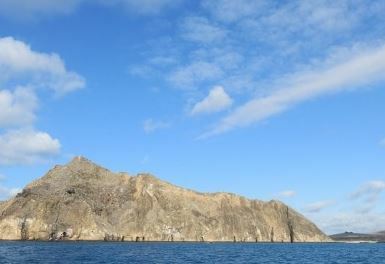 However, the climber’s ultimate reward is one of the most beautiful panoramas in all of the Galapagos Islands – the view towards Pinnacle Rock with black, volcanic cones of Baltra, Daphne Major and Daphne Minor in the distance. 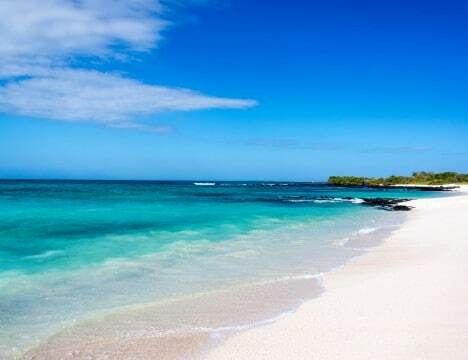 Playa Espumilla is located on the northwestern side of Santiago Island and is home to a variety of wildlife including nesting green sea turtles, and plentiful birds such as flamingos, White-cheeked Pintails, Yellow Warblers, Galapagos Hawks, Whimbrels, and American Oystercatchers. Zodiacs will land you at the center of the white-sand beach to join a trail that passes by a seasonal lagoon hosting a variety of bird life. The trail then leads inland to a fragrant Palo Santo (incense tree) forest before looping back to the beach in a lazy circuit past the mangrove-fringed lagoon, where you can watch shorebirds work the mudflats for their dinner. The agile Silver Galapagos can anchor in deep water right up against the cliffs of Punta Vicente Roca on the northwest side of Isabela Island. From our anchorage Zodiacs set out to cruise beneath the imposing volcanic coastline. The cliffs support endemic Flightless Cormorants, Galapagos fur seals, Blue-footed Boobies, and marine iguanas. 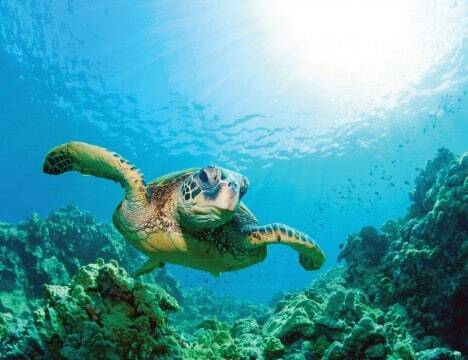 The waters below hold scores of Eastern Pacific green sea turtles swimming all around the Zodiacs. If conditions allow, fortunate snorkelers will have an opportunity to swim with eagle rays, Galapagos sea lions, Galapagos Penguins, and schools of small tuna in the blue. 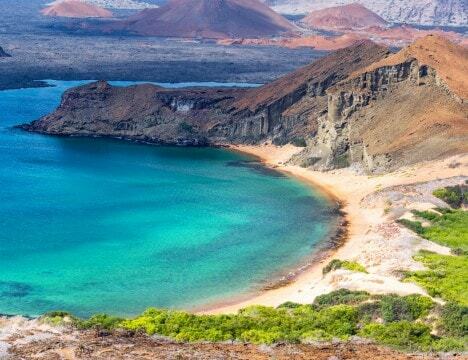 With the gentle slopes of La Cumbre volcano in the distance, the low, lava-forged coast of Punta Espinoza on Fernandina Island is a spectacular sight. Hundreds of marine iguanas rest on the black rock of recent lava flows absorbing heat from the stone and defending their territories against one another. Galapagos sea lions and their pups also take shelter here, resting on the beach and playing in the shallow tide pools sprinkled along the coast. Walk past high sandy areas where marine iguanas lay their eggs and along low, shallow mangrove ponds ringed with bright red Sally Lightfoot crabs and Flightless Cormorants drying their stubby wings in the sunshine. Tagus Cove is a sheltered area southwest of Volcán Darwin on Isabela Island. The protected waters of this cove are home to sea turtles, marine iguanas, Flightless Cormorants and Galapagos Penguins. In addition, the cove has offered safe anchorage to visiting ships through the ages. Here you can choose to kayak, snorkel or head ashore to discover centuries-old names of vessels that were painted or carved onto the rock near the landing site. After landing by Zodiac, you may hike through the forest of Palo Santo trees to access the upper reaches of a volcanic cone. Watch for several species of Darwin finches and curious mockingbirds as you ascend. From the track’s high point the panoramic view is spectacular. The tranquil inlets of Elizabeth Bay are the perfect spot for a Zodiac cruise. First pass the “Las Marielas” islets, which are home to Blue-footed Boobies, Flightless Cormorants, Galapagos Penguins, Galapagos sea lions and Sally Lightfoot crabs. Then journey on into the bay flanked by the massive volcanoes of Sierra Negra and Alcedo and continue past fresh and desolate lava fields heading towards tall green mangrove trees growing out of black lava shores. In the easternmost embayment lies a hidden inlet. Our nimble Zodiacs can enter this small cove to look for sea turtles, rays and even sharks. Post Office Bay is steeped in history and received its name thanks to a post box that was placed ashore before 1813. Ships that were visiting the Galapagos on multi-year voyages would leave letters here to be collected and delivered by vessels on their way home. Visitors today can keep the tradition alive by leaving their own postcards in the post box (now a barrel) and looking for any they can deliver by hand back at home. Activities at Post Office Bay can include exploring a cave created by lava that runs underground towards the ocean. The bay itself offers kayaking along the shore and into Mystery Bay, snorkeling, swimming and relaxing on the beach. Floreana Island’s northernmost point is called Punta Cormorant – named after the British naval vessel HMS Cormorant and dating back to the late 19th century. From the landing beach a short track leads to a shallow lagoon that is famous for its flamingos. 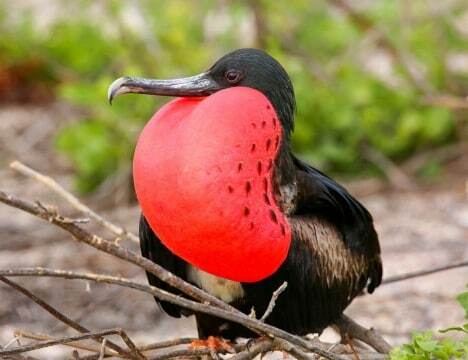 The brilliantly pink birds skim the salty waters for shrimp and tend to chicks on the nest. The trail then scales a low hillside through scattered Palo Santo trees to reveal an idyllic white-sand beach on the other side of the point. Standing at the edge of the lapping waves, you might spot mammoth female sea turtles hauling themselves out of the sea to lay eggs in the sugar sand dunes that lay high above the tide line. Cerro Dragón’s land iguanas once played an important part in a conservation program headed by the Charles Darwin Foundation and the Galapagos National Park. When the reptiles’ numbers declined in the 1970s, some animals were taken to breed in captivity and were released back into undeveloped areas. Today, it is an honor to see the success of this program firsthand at Cerro Dragón. Walk inland on a trail past small saltwater lagoons that periodically feature flamingos, to see the reintroduced animals. In a periodic local phenomenon, during rainier times the salinity in the lagoons drops with the inflow of freshwater. On the northern shore of Santa Cruz stretch the Las Bachas beaches. The two beaches together span a full kilometer. A short track leads visitors inland towards a shallow pond with the opportunity to spot flamingos, migratory birds in season, and scavenging shorebirds. The name “Las Bachas” derives from the mispronounced term “barges” –which the American forces had left behind after World War II. On our visit to Las Bachas there will be the chance to swim from one of the two sandy beaches and to look for sea turtles that use Las Bachas as one of their major nesting sites in the islands. Los Gemelos is Spanish for “the twins” and true to the name, Los Gemelos are twin sinkholes, one on either side of the road running from Puerto Ayora to the north side of the island. The mammoth scale of the landmarks often elicits exclamations of wonder from visitors at first sight. The vertical walls of the sinkholes fall deep into the ground covered in a veil of greenery hiding the bottom of the pit. Walk along the craters’ edges before stopping at Rancho El Manzanillo to see giant Santa Cruz tortoises in the wild. On the ranch swap walking shoes for knee-high rubber boots and wade out in to the green fields to come close to majestic giant tortoises and search for the coveted Woodpecker Finch. Silver Galapagos will anchor in front of Puerto Ayora, Santa Cruz, where the prestigious Charles Darwin Research Station is located. The station also houses the Fausto Llerena Breeding Center for giant tortoises and land iguanas where guides interpret the center’s captive breeding and reintroduction programs. In addition to these star species, throughout the station there are huge prickly pear cactus trees being fed upon by the pretty Galapagos Cactus Finch. To round out the stay in Puerto Ayora, enjoy free time in town where local artists have created charming art galleries and corner cafés. .
Baltra Island, also known as South Seymour, is the gateway through which most people enter and depart the Galapagos Island. Following breakfast, disembark Silver Galapagos for your return flight from Baltra Airport.